I talked recently with a man who had relocated from Michigan to Gardiner, Montana, a small town just outside of Yellowstone. Given that both states have wolves, we discussed them. The man, large enough to be a pro-football lineman, said he often hunted for deer in Michigan’s wolf country. He recalled one day when he was sitting in his blind and heard wolves howl. He felt a tingle of fear. As darkness fell and he made his way to the car, the wolves howled again, too close for his comfort. As he hustled through the woods, he had a pistol in one hand and a rifle in the other. His headlamp beam moved like the light on a prison guard tower, as his head swiveled left to right. “I’ll tell you, the hairs were up on the back of my neck, and I was ready to blast them wolves if it came to that,” he said. His fear was obvious and real. But was it realistic? A few days later, I once again searched for an answer to the question of whether we should fear wolves. I found two documented fatal — and tragic — attacks by wolves in North America. On Nov. 8, 2005, searchers recovered the body of a man in northern Saskatchewan. Two years later a jury found that he had died from “injuries consistent with a wolf attack.” An investigator suspected that the attacking wolves might have lost their fear of people after eating at open garbage dumps. Luigi Boitani, wolf expert, expressed a different opinion in a 2015 interview with Spiegel. He said that the man had apparently been feeding the wolves regularly and that this could cause them to lose their fear of people. On Mar. 8, 2010, the body of a woman was found along a road near a rural Alaskan community. The Alaska Department of Fish and Game — relying on DNA evidence for the first time — concluded that wolves killed her and that the wolves were not defending a kill or habituated to people. So wolves have killed two people, one in Alaska, one in Canada. But what about in the lower 48 where that hunter feared for his safety? A 2002 report prepared for the Alaska Department of Fish and Game found no human deaths in North America attributed to wild, healthy wolves since at least 1900. In 2011, a spokesperson for the Oregon Department of Fish and Wildlife said that no wolves have attacked humans in the Rocky Mountain states. The Oregoniannewspaper investigated the claim. A reporter contacted the International Wolf Center in Ely, Minnesota, where a spokesperson stated that wolves have not attacked humans in the lower 48. I found no other reports since 2011 of fatal wolf attacks. But I did come across statistics that help place those two wolf-related fatalities in a different light. The National Canine Research Council reported 41 confirmed or potential fatal dog attacks in 2014 and 32 verified fatalities in 2013. Records at the International Hunter Education Association show that during one six-year period 265 people died in hunting accidents. An article from The Interstate Sportsman reports that each year in this country 1,500 to 1,800 people drown, and 800 to 875 die in boating accidents. Dog attacks, drowning, and hunting and boating accidents claim far more lives than wolves have or ever will. Yet I don’t hear anyone demanding that we eradicate all dogs or ban hunting, swimming, or boating so that we can protect ourselves from such dangers. The chance of wolves killing people are minuscule; there are many greater fears to worry about. That some people use the fear of wolf attacks as a way to justify killing wolves — an endangered species — is another example of the incredible power of the myths and misinformation that surround these essential predators. As always, I welcome your comments about this topic. Rick Lamplugh is a wolf advocate and author of the bestselling “In the Temple of Wolves.” Available as eBook or paperback. Or as a signed copy from the author. Learn more about the creation of worldwide wolf hatred. ORONO, Maine — The U.S. Fish and Wildlife Service approved a permit today allowing trappers and state agents to injure or kill federally protected Canada lynx during Maine’s trapping season and as part of state-run predator control programs. The permit approval comes less than a month into Maine’s 2014 trapping season, during which 13 lynx have already been reported captured albeit released alive. Two lynx required veterinary treatment for injured toes. Wildlife advocates say the state’s plan to minimize harm to lynx, which is required in order to obtain the federal “incidental take” permit, falls far short of what is actually needed to safeguard the forest-dwelling cats from trapping, to which they are particularly susceptible. The state plan requires trapper education — primarily through the distribution of a new DVD to all licensed trappers — and management of a mere 6,200 acres of state forest for lynx reproduction. Even within this small mitigation area, however, Maine intends to allow trapping. To monitor “take” of lynx, the state is relying almost exclusively on trappers to voluntarily report when they accidentally capture or kill a lynx. The final permit includes coverage for several new activities that were not considered by the Fish and Wildlife Service in earlier draft rounds of the permit. In addition to Maine’s recreational trapping program, the state added to the final permit its Predator Management and Animal Damage Control programs. As part of these state-funded programs, the state pays trappers to kill wildlife such as coyotes, beaver and foxes. The predator management program pays incentives and gas money to trappers who will travel to remote parts of the state to kill coyotes, as part of Maine’s effort to maintain high deer populations. Within these programs, the state will also allow the use of cable restraints, which capture animals around the neck but are designed to not asphyxiate them. However, cable restraints designed for smaller mammals may kill, larger, non-target species, such as lynx. The state plans to phase in use of cable restraints in the general trapping program. Maine will also open the state to use of larger traps than previously allowed. The Canada lynx is a wild cat of northern latitudes and snowy climes. It weighs between 14 and 31 pounds, has large, furred paws, long, black ear tufts, and a short, black-tipped tail. In the lower 48 states, it is found only in a few areas, including Washington state, the northern Rockies and Minnesota. In the Northeast the only breeding population of lynx is in northern Maine, where several hundred live. The lynx was listed as a threatened species under the federal Endangered Species Act in 2000. Because of the threat of Maine’s coyote-snaring program to the lynx, the state and the federal Fish and Wildlife Service commenced negotiations on an incidental-take permit in 2002. A lawsuit brought by wildlife groups against the state’s trapping program a few years later led to an interim plan for lynx protection, until the Fish and Wildlife Service approved Maine’s permit application for the “incidental take” of lynx under the trapping program. Wildlife groups reject the near-exclusive reliance on trapper self-reporting as the means by which the state and the federal government monitor lynx take. Lynx activists say more active law enforcement, including unannounced inspections of trapper operations, as well as lynx exclusion devices on all killing traps, padded or offset trap jaws, and a ban on the use of chain drags and wire snares, are needed to ensure that the fewest lynx possible are hurt or killed in traps. In addition, wildlife advocates say the trapping plan should hold the state to a higher standard of proof than trapper self-reporting that lynx are not injured by trapping. A previous study of radio-collared lynx in Maine showed that after being caught by trappers, only three of six lynx survived a month. Map by Curt Bradley, Center for Biological Diversity. 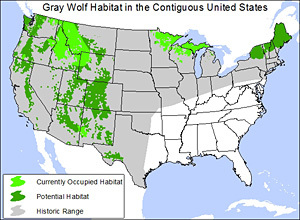 This map and wolf photos are available for media use. The report comes as the Obama administration moves to strip Endangered Species Act protection from gray wolves by the end of the year, even though wolves have been recovered in less than 10 percent of their historic habitat and are routinely trekking hundreds of miles to disperse to areas of the American landscape they once called home. Since endangered species protections were taken away from wolves in 2011 in the northern Rockies and western Great Lakes, the states have enacted aggressive hunting and trapping seasons designed to drastically reduce populations. To date more than 2,800 wolves have been killed, resulting in a 9 percent population decline in the northern Rockies and a 25 percent decline in Minnesota. Idaho passed legislation this year creating a “wolf control board,” with the sole purpose of killing wolves, and appropriated $400,000 for the task. Removal of protection in the rest of the country will ensure that anti-wolf prejudices prevail and wolf recovery is stopped in its tracks.